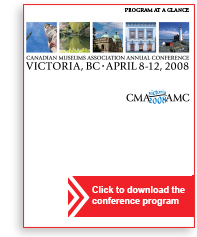 In 2013, the CMA National Conference returned to beautiful Whitehorse, Yukon for the first time since 1998. This close-knit northern community was the perfect setting in which to celebrate the theme "Cultural Collaborations". More than 230 delegates had the golden opportunity to learn and network during a variety of study tours, workshops, lectures and events. Keynote speakers with varying backgrounds shared their valuable knowledge in dynamic (and sometimes hilarious) addresses which even included an unforgettable musical performance. The CMA was once again proud to celebrate excellence in the Canadian museum field by presenting 24 awards to deserving institutions and individuals. Being "on the edge" can have various meanings. It can refer to being in a precarious position, or in a state of keen excitement; showing audacity and innovativeness, or being tense and nervous. 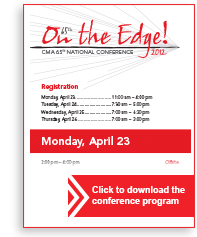 CMA's 2012 National Conference shook up usual best practices with some out-of-the-box and aggressive action, a provocative approach that brought you On the Edge! Participants were inspired by the amazing keynote speakers, including Chantal Hébert, Robert Sirman, Michaëlle Jean, David Buckland and Olivia Chow. Several mobile bootcamps were held and, due to the previous year's success, we held a second Ignite session. 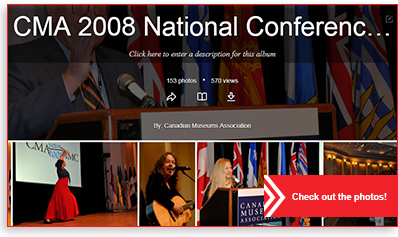 CMA'S 2011 National Conference took a serious look at how the museum sector has changed, the hyper-speed at which these change are taking place and how cultural organizations can be sustainable in such a setting. Participants reflected on the explosion of communications and social media, the importance of community engagement, and the evolution of museum structure. 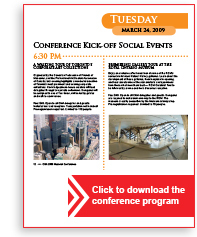 The conference featured dynamic speakers from all parts of the country and the world, cutting edge workshops and educational sessions, and introduced the first museum sector Ignite talks. 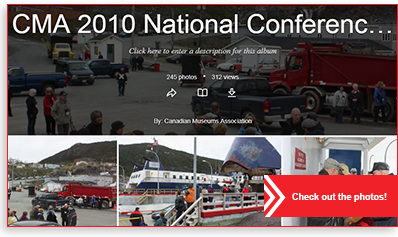 St. John's, Newfoundland and Labrador CMA 2010 featured exemplary work in human and natural history museums and art galleries that fulfill our traditional mandates. 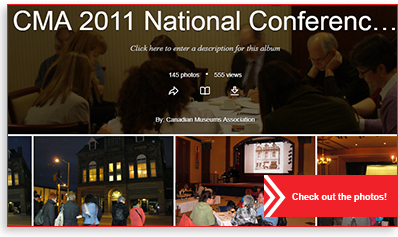 There was also a strong program stream for community museums. 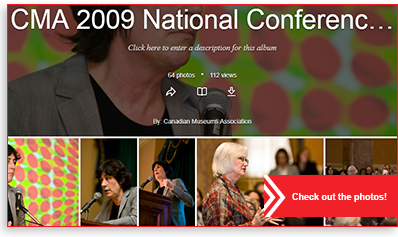 As a highlight of the 2010 conference, we placed a special focus on Intangible Cultural Heritage (ICH), providing an open forum for discussion of practical approaches by which museums can creatively link people and place to collections in order to inspire meaning. 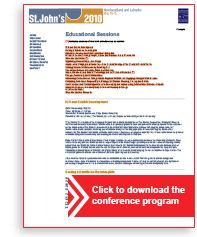 We will be showcasing UNESCO's leadership in ICH and examining Canadian and international models. Is there a winning formula to enhance the relationship between museums and their communities? The CMA's 62nd national conference addressed a combination of elements that represent the changing concept of citizenship, setting critical agendas that should really influence people both within and outside of our community. Contributors included recognized figures on the political and cultural scene. How do you harness tomorrow's opportunities and ensure that you and your institution are adding value to your visitor experiences and to your community? 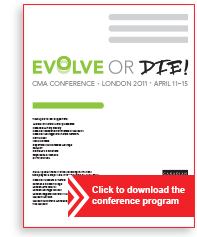 By securing practical information, knowledge, cost effective solutions, and networking at the CMA's 2008 annual conference. 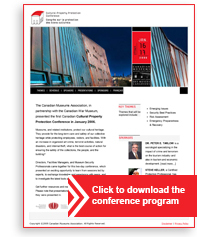 The CMA's 61st conference challenged you to think far beyond the four walls of your institutions, to think beyond the physical spaces of your museums to reach new and non-traditional audiences. 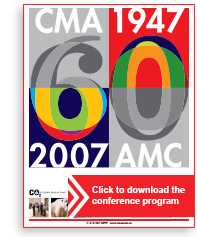 Sixty years ago, in Quebec City, a small group of dedicated professionals created the Canadian Museums Association (CMA). 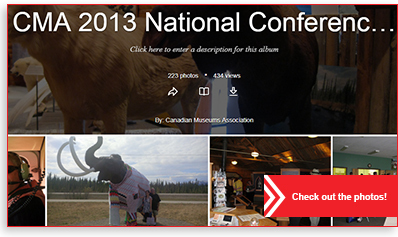 Today, Canada boasts a network of world-class museums and professionals. 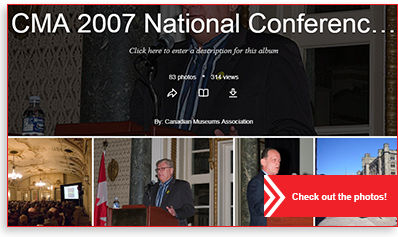 In 2007, the CMA celebrates the vision and passion of those individuals, addressing the fundamental and changing roles of the museum sector as we look toward the next 60 years.